PONDA: The Ponda is known as the temple town of Goa, as it has the highest number of temples. Similarly, it is also known for several high hills, adding beauty to these temples and attracting tourists. However, these hills are slowly vanishing, as the builders are illegally levelling them to the ground to build commercial and residential complexes and make huge money. Many hills are lost this way. The hills are purchased at cheap rate and levelled to the ground in connivance with the authorities. Since long, the villagers of Mangueshim and Curti have been raising their voice by leading morchas against such activities; they had even stopped some hill cuttings. However, some greedy builders do find a way to destroy the hills. The Mangueshim villagers have even filed a Court case against a mega project and stopped its construction on a hill in forest area. The illegal hill cutting has affected many natural springs, medicinal trees and agricultural activities. Presently, a hill at Khadpaband in Ponda located by the side of the bypass is being cut and construction of a building is progressing. Similarly, another Hill on Dhavlim-Farmagudi located by the side of the bypass road is totally levelled by unknown persons. According to locals, the land on hilly area is purchased at cheaper rate and then levelled to the ground making way for construction activities. 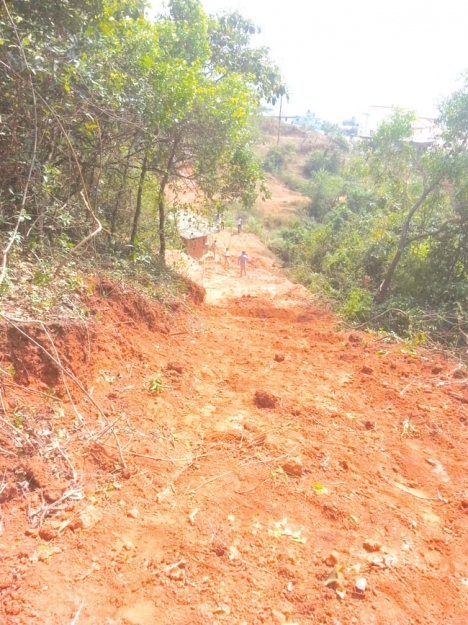 The hills have fallen victims not only to builders, but also to National Highway widening. On Wednesday, following a complaint by Curti locals and members of Rainbow Warriors, the forest officials seized a JCB machine involved in hill cutting at Zingadimal in Curti. Several trees on the hill were also felled. An offence has been registered against one Niranjan Jain. According to Curti local Rocky Dias, when complained, the Flying Squad said that they had no vehicle to inspect the place of hill cutting.